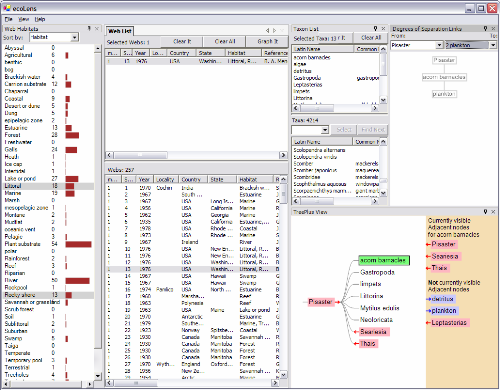 HCIL conducts other research in Bioinformatics Visualization. Current collaborators: Catherine Plaisant, HCIL; The SPIRE project UMBC; Phil Myers, University of Michigan Museum of Zoology; Bill Fagan U Maryland Biology; Kevin Omland UMBC Biology. Former team members and collaborators include Dana Campbell, Jeff Jensen, Svetlana Yarosh, and eight undergraduate design partners. Please contact us at our individual email addresses. Lee, B., C.S. Parr, C. Plaisant, B.B. Bederson, V.D. Veksler, W.D. Gray, and C. Kotfila. Interactive Exploration of Networks with Enhanced Tree Layouts, Appeared in TVCG Special Issue on Visual Analytics. Lee, B., C.S. Parr, C. Plaisant, and B.B. Bederson. Visualizing graphs as trees: Plant a seed and watch it grow. Proceedings of Graph Drawing 2005, Lecture Notes in Computer Science 3843, Springer-Verlag, 516-518. Parr, C.S. and M. Cummings. 2005. Data sharing in ecology. Trends Ecol. Evol. 20: 362-363. Parr, C.S., R. Espinosa, T. Dewey, G. Hammond, and P. Myers. 2005. Building a biodiversity content management system for science, education, and outreach. Data Science Journal 4:1-11. Parr, C.S., B. Lee, D. Campbell, and B. Bederson. 2004. 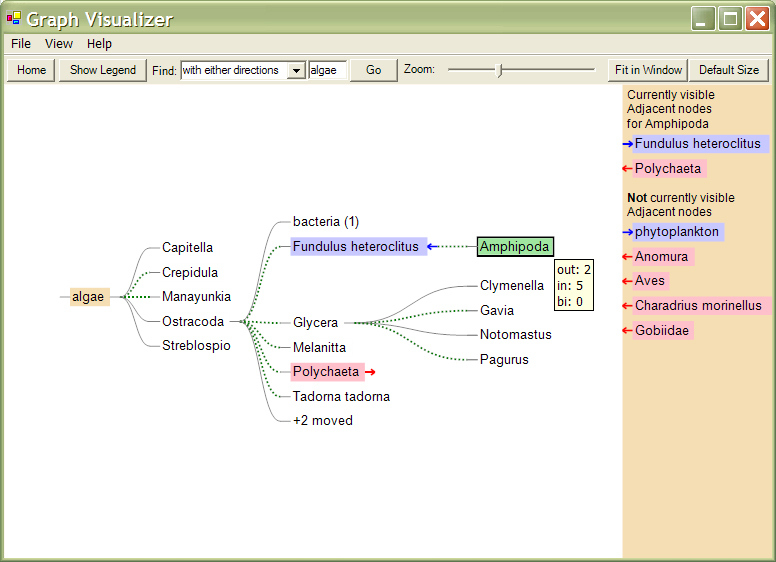 Tree visualizations for taxonomies and phylogenies. Bioinformatics 20(17):2997-3004. Supplementary figure. See prototype downloads for datasets. Lee, B., C.S. Parr, D. Campbell, and B. Bederson. 2004. How Users Interact with Biodiversity Information Using TaxonTree. Proceedings of Advanced Visual Interfaces (AVI 2004) pp. 320-327. ACM Press. An earlier version of this manuscript is available as TaxonTree: Visualizing Biodiversity Information. Technical report HCIL-2003-40. Parr, C.S., B. Lee, D. Campbell, and B. Bederson. 2002. Tree browsing: Visualizing biodiversity information, Biosciences Day poster presentation, University of Maryland, 2002. We hosted the HCI in Biodiversity Informatics workshop on June 2, 2005. Please note that this is a draft not actually in use by ADW. It is in revision by the SPIRE project. Please contact Cyndy Parr for more information. We provided Classification datasets for the InfoVis 2003 contest. Video tutorial: [QuickTime format] 2:30 min, 26MB, best viewed at 1024x768. EcoLens without .NET if you already have Microsoft's .NET Framework installed (670 KB). Run EcoLensSetup.msi to install. EcoLens with .NET if you need .NET (23 MB). Unzip the file and then run EcoLensSetup-With-dotNet.exe to install. Released 12 December 2005. Not compatible with Macintosh. Data reside on an online database so you must be connected to the internet to use EcoLens. Let us know if this is a problem for you. These data, described here, are also being used by the SPIRE project in different formats to model interactions among organisms and serve as a testbed for semantic web technologies in this domain. Database schema: in XML, can be downloaded here (this is a little out of date as of October 2005). We have developed a new graph visualizer to enable exploration of large, complex food webs. Ultimately, this system, embedded in ecoLens, above, will allow biologists to test approaches to modelling interactions among organisms. 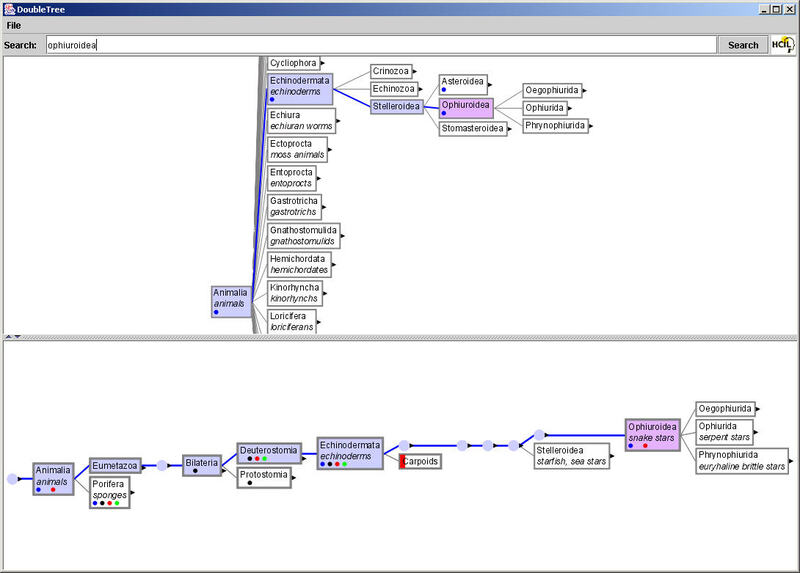 While inspired by SpaceTree and TaxonTree, it is an entirely new application written in C#. Please see HCIL's TreePlus page for more information, including a video demonstration. 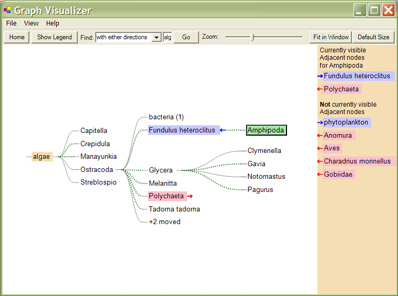 TaxonTree combines dynamic query interfaces and zoomable graphics to visually accommodate highly interconnected data such as the Linnaean hierarchy for Kingdom Animalia . Because the structure of the data is visualized, the interface should be suitable both for biologists and for the general public. Names of organisms are essential to any biological database, including genomic databases, so a tool that allows effective searching and browsing of these names has wide application. TaxonTree allows full-text searching and browsing of a large, widely used multimedia database, University of Michigan's Animal Diversity Web via a classification of almost 200,000 animal names. At higher levels, binary branching illustrates relationships, and synapomorphies supporting those relationships are also available. Scientific names have been compiled from ITIS, the UMMZ Bird Division, the EMBL Reptile Database, Mammal Species of the World, and material from University of Maryland's BSCI 224 course taught by Jeff Jensen. TaxonTree is built on SpaceTree, one of the HCIL Products. If you need information on licensing SpaceTree source code please contact Gayatri Varma at the Office of Technology Commercialization 301-405-2960 or gayatri@umd.edu. Online versions: As of Summer 2005 you can find TaxonTree behind any "Show in TaxonTree" link at http://animaldiversity.org. By using TaxonTree you give us consent to use logs of your use for our research on information retrieval interfaces. We will not have any personal, sensitive information about our users. If you do not already have a current version, download Java. Stand-alone version: Download: taxontree-1.2.zip released September 2003 (12 MB). Not compatible with Macintosh. If you do not already have a current version, download Java. To run, double click on the taxontree.jar file. Tree A (from Bioinformatics paper) is included as taxon.mdb. DoubleTree is an an application for comparing two trees using coupled interaction. DoubleTree is built on TaxonTree. Video demonstration: Windows Media Player (1:22 min, 1 MB), Real Media (2.7 MB). Stand-alone version: Download: doubletree-0.7.zip released December 2003 (25 MB) This prototype lacks many features and has several content bugs but illustrates the basic concept. . If you do not already have a current version, download Java. Not compatible with Macintosh. To run, double click on the doubletree.jar file. 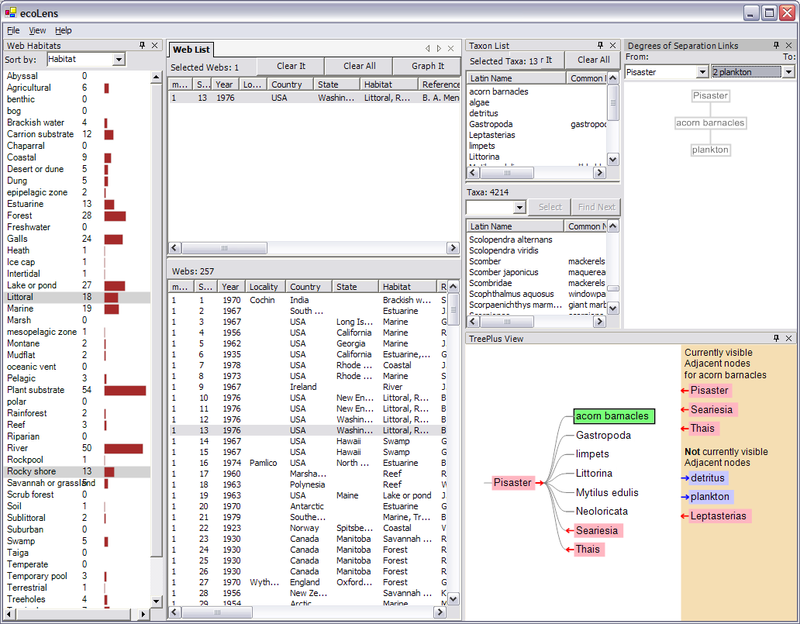 Included are three trees; default settings show a folk tree in the upper pane (Tree C from Bioinformatics paper), and the combined phylogeny/taxonomy described above for TaxonTree in the lower pane (Tree A). To swap the folk tree for an ITIS tree, rename taxon_alt.mdb (Tree B) to taxonA.mdb. This material is based upon work supported by the National Science Foundation under ITR Grant No. 0219492. Any opinions, findings, and conclusions or recommendations expressed in this material are those of the author(s) and do not necessarily reflect the views of the National Science Foundation.